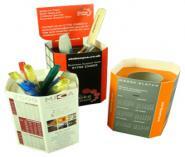 Desktop pen holders are a great option when it comes to business marketing and here is why. There are direct marketing professionals who would be absolutely delighted for their campaign to simply 'make it past the gate keeper' but why stop there? What is there to say that promotional pieces such as our pop up mailers should stop working after they have created such a big impact? To achieve this you don’t need to do much more than to ask us to add a few holes in one surface of our pop-up mailers, thereby creating desktop pen holders – company promotional products that will stay on your customer’s desk top for months and months. 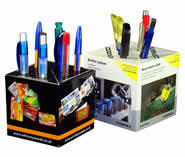 Branded desktop pen holders are useful promotional desk accessories. Some of our most popular automatic pop-up mailers are absolutely ideal for the transformation from mailer to desktop pen holder. The main requirements of the popupmailer promotional pen pots are that they have the strength, stability and size to hold a certain number of pens whilst still having an attractive and appealing appearance on the desk top. The most common characteristic amongst the suitable candidates for desk top pen holders is that they sit on a sturdy and stable base. Let’s take a look at them individually. Our Pop-up Cubes are perfectly suited for conversion to a promotional pop up pen holder are sized between 85mm to 95mm cubed. The two trapezium-shaped pop-up products, the Pop-up Castle and the Pop-Up Chocbox also make extremely attractive promotional pen pot advertising ideas when used as desktop pen holders. 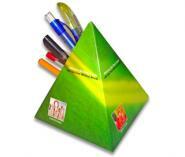 The fourth pop up mailer candidate that has a square base is our Pop-up Pyramid desk top pen holder. The pyramid is a unique shape for a pop up desk tidy; it has a most unusual design making it a very eye-catching desk top pop up pen pot . 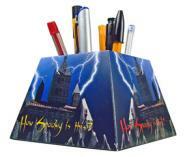 Your pop up mailer desk top pen holder doesn’t have to be square to supply stability. The rectangular base of a Pop up Cuboid, for example, provides ample support for your desktop pen holder needs. The Pop-up House desktop pencil holder which also has a sturdy rectangular base is not only quite solid, it also offers a very attractive and eye-catching option for a promotional pen holder. Perhaps the most unusual shape for one of our pop-up mailers to act as a desk top pen holder or pen pot is the Pop-up Ball which combines functionality and decoration perfectly. Not every automatic pop-up pen holder is a conversion from a standard pop-up mailer. 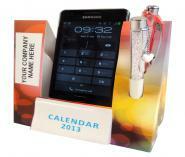 We do carry in our pop up mailers range a fully-automatic desktop pen holder which we call the Power Pen Pal. Unlike the other shapes of pop up mailer which have been adapted to become desk top pen holders, this pop up pen pot was specifically designed for use. 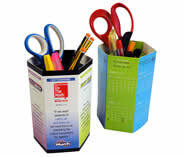 This promotional desk tidy pen pot with one big hole at the top which can hold not only pens and pencils but also rulers, scissors and other such items that are regularly found on desk tops. Our pop up mailers have all been designed for use predominantly as promotional B2B direct marketing products and as you might expect, each one is supplied with a specially designed mailing pack. This is not only to satisfy the “3 second rule” which we go on to talk about further down this page, but also to protect the popup pen holders products in the mail. The desktop pen holders and their corresponding mailing packs are made from 500micron white lined folding box board and are printed and die-cut from the same sheet. This means that when you choose pop up mailers your whole promotion is custom printed exactly as you would have it – the pop up pen holder and the mailing pack. Our desktop pen pots and pop-up pen holders really create an impact when they arrive and so are perfect for promotional direct mail campaigns, but we appreciate there may be times when less boisterous examples of desktop pen holders are sometimes required. We have a variety of shapes of push up promotional pen holders and have made many thousands of desk top pen holders products they are a first class direct marketing tool. The simple manual push-up action creates a very sturdy desk tidy which will stay on desk tops for a long time. 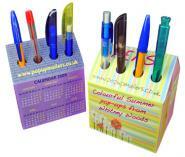 Desktop pop up pen holders from Popupmailers.co.uk will stay on desk tops for years, many of our customers take an extra step to guarantee the longevity of the promotion by adding calendar print. Each year we print many products from our range of promotional pop-ups as calendars and the most popular choices are the pen pals. We know that this product is well-received since we have companies coming back for repeat orders every year. Are you familiar with direct mail’s three minute and 33 second (3:33) rule? It’s important when you talk about openability. The 3:33 rule suggests you have three seconds or less to stand out in the mail and stay out of the trash, then 30 seconds to engage the reader enough to get opened and make the “short stack” for later reading. After the first 33 seconds—if you actually get the reader inside your mail piece—she spends an additional three minutes or less reading it and deciding whether or not to respond. Think carefully when choosing your next business communication product! Business to business direct marketing can be a huge waste of money unless you get it right - so you need to get it right first time. Far too many business to business direct marketing campaigns go straight to the bin, often before the envelope has even been opened and therein lays the first problem – envelopes. A flat, plain white envelope with a frank or a PPI holds absolutely no mystery whatsoever. Send your business to business direct mail out in a plain white envelope and your campaign is already well on the way to generating a high level of indifference. With that thought firmly in mind, you should give very strong consideration to the type of carrier to use. Once the mailing pack has done its first job in attracting the reader’s attention it then has to entice the reader to open it. We believe that the pack has to be designed in a way that is not too hard to open and leads to the main promotional piece without too much trouble. We say this as the promotional piece itself will take care of the next few minutes – no problem! A B2B promotional mailer needs to capture the imagination of your customer and our products do this because they have an automatic pop-up action. This action carries with it the elements of surprise, fun, interaction and curiosity. Our rubber-band-powered automatic pop-up product easily pass the 30 second test and usually account for the next few minutes during which time your promotional message has been well and truly digested.